Published: July 14, 2014 at 01:01 p.m. Updated: July 27, 2014 at 07:21 p.m. Given Bill Belichick's respect around the league, and the fact that he's praised weekly by broadcasters from CA to MA, isn't it a touch striking that his Patriots haven't won the Super Bowl since the 2004 season? Yes, Belichick has set the bar so high that he has to raise the Lombardi Trophy to reach it. Such is life for an all-time great. Then again, a third straight AFC Championship Game appearance in 2013 showed this guy can indeed coach a little bit. While many of you can probably predict where I place the Pats czar on this list, you might be surprised to see how all the other organizational frontmen stack up against each other in my annual Head Coach Power Rankings. (As a point of reference, here's a link to last year's edition.) Whatever thoughts you have, I'd love to hear 'em: @HarrisonNFL is the place. Allen ranks 32nd for the second year in a row, mostly because we just didn't see improvement from his Raiders from Year 1 to Year 2. Allen came from the defensive side of the ball in Denver, and that is exactly where many of the Raiders' problems still lie. (Quarterback has been an issue, sure, but this D just gave up the most points in the AFC.) Allen is getting another shot in 2014, which he deserves, given where this club was at -- talent-wise and cap-wise -- when he took over. Head coach Rex Ryan received much of the credit for the Jets' stout defenses during Pettine's coordinating days in New York, but this guy clearly knows what he's doing. Just look at his work last year in Buffalo, when he transformed a sieve into a top-10 D. Of course, it's public knowledge that Pettine was not Cleveland's first choice. Throw in the fact that there is already a media circus brewing around his young quarterback, and it's clear this guy faces some notable challenges in Year 1. Opinions vary on Gruden, no doubt, but the Bengals' offense was potent with him at the controls (... at least during the regular season). The lack of consistency in Andy Dalton's game has not left a black mark on Gruden, obviously, as Redskins GM Bruce Allen made the hire with Washington's own young quarterback in mind. Let's see what Gruden can do with Robert Griffin III -- as well as free-agent acquisitions DeSean Jackson and Andre Roberts -- before giving him a loftier spot on this list. There are quite a few folks who feel that O'Brien can turn Houston around immediately. Considering the Texans just went 2-14, that could be a tall order for a first-time NFL head coach. O'Brien advocates cite his ability to work with quarterbacks (Tom Brady in New England, Matt McGloin and Christian Hackenberg at Penn State) and his overall character. With J.J. Watt, Jadeveon Clowney and Brian Cushing in tow, he has the horses on defense. Zimmer brings a new energy and healthy résumé to Minnesota. Zim cut his teeth in the NFL as an assistant with the Cowboys, helping the team finish No. 1 in total defense in 1994 and win a Super Bowl in '95. Eventually taking over as the D-coordinator in Big D, Zimmer directed the NFL's top-ranked unit in 2003. Over the past six seasons in Cincinnati, Zimmer made the Bengals' defense into a fearsome unit. If there is one dark-horse team in the NFL that no one is talking about, it has to be the Bills. Marrone's biggest task is getting EJ Manuel up to snuff, as Buffalo's defensive personnel is about as solid as any group in the AFC. Marrone honed his offensive prowess during a stint with the Saints under Sean Payton before heading to Syracuse to revitalize his alma mater. Working with a number of young players on offense, Marrone's viability as an NFL head coach will be tested in Year 2. If you watched the Jaguars play in 2013, you saw a team that improved over the course of the season. Sure, they still finished 4-12, and it's hard to ham up that kind of W-L record. But Bradley clearly is putting his stamp on his team. Also worth praising: The subtle moves GM David Caldwell has made in free agency, picking up Bradley's kinda guys -- which is a reflection of the level of respect the front office has for its head coach. You feel like the Dolphins are close, and that Philbin might be building something ... but then you also can make a case that the club will finish last in the AFC East. In his first two seasons at the helm, Philbin won 15 games, which is not a bad number, considering where this football team was upon his arrival. The Bullygate fiasco really needs to go away, though. Mike Pouncey could help on that end by wising up a bit. While Chicago fell just short of the playoffs at 8-8, Trestman did a solid job in his debut campaign, considering he was implementing a brand new scheme and lost his starting quarterback for a healthy chunk of the year. (Not to mention all of the injuries on the defensive front.) That said, the Bears did go 10-6 in Lovie Smith's last season. The 2014 campaign should tell us more about whether GM Phil Emery made a good move in tapping Trestman for the job. Give Garrett credit -- at least he's consistent! Three straight years now, the Cowboys have finished 8-8. And in each of those three years, the 'Boys entered the final game of the season with an opportunity to win the NFC East. Of course, the downside is that Dallas has not been able to pull out any of those Week 17 tilts. (In fairness, Tony Romo was injured for last year's title bout with Philadelphia.) Truth be told, Garrett might have to do his best work ever to get the Cowboys to 8-8 in 2014. 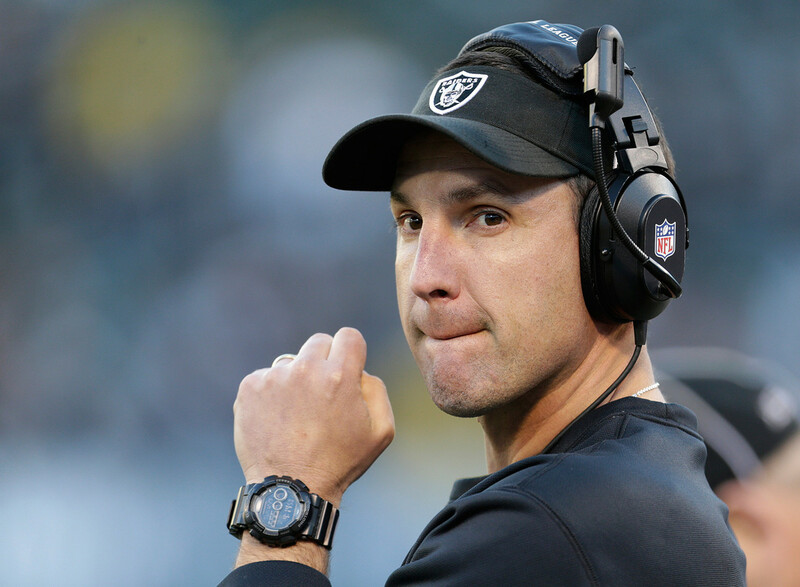 Fairly or unfairly, Caldwell has much to prove in his second go-around as an NFL head coach. While the Colts made it to the Super Bowl in his debut season of 2009, many felt that it was "Tony Dungy's team." (And if not Tony Dungy's, then Peyton Manning's.) In Detroit, Caldwell has an opportunity to show that his leadership style works. But with Green Bay and Chicago in the NFC North, he certainly has inherited a challenge. The 2013 AP Coach of the Year might have some difficulty leading the Panthers back to the postseason in 2014, given that both the Buccaneers and Falcons should fare better than they did in 2013. Regardless of what happens this upcoming season, the former linebacker did a heckuva job rallying back from being on the hot seat to leading the Panthers to win the NFC South at 12-4. One of the more under-reported stories of the 2013 season: The job Whiz did with the Chargers' offense. And it wasn't just Philip Rivers' revival; the running backs were hell on wheels for opponents, as Ryan Mathews enjoyed his most prolific rushing season and Danny Woodhead caught 76 balls. Can Whisenhunt have the same impact in Tennessee? While Kurt Warner gets most of the praise for guiding the Cardinals to Super Bowl XLIII, try to recall who made Warner the starter. McCoy's task is to push the Chargers a bit farther in 2014, although San Diego did pretty well to get as far as it did last season. McCoy's Bolts got hot late in the season, winning five of six to make the playoffs, then upsetting the Bengals once they got there. McCoy tutored Tim Tebow in 2011, worked with Peyton Manning in 2012 and played a huge role in Philip Rivers' Comeback Player of the Year effort last season. Kelly is a man who could shoot up this board awfully quickly. His first year in Philadelphia was a smashing success, as the Eagles won 10 games and took the NFC East title in the process. Kelly's explosive offense lived up to the billing, ranking second in the NFL and causing other teams to look at tempo more closely on both sides of the ball. Fans and media alike weren't quite sure how to assess Pagano after Year 1, as a fight with leukemia forced him off the sidelines and his offensive coordinator (Bruce Arians) went on to win Coach of the Year honors. However, the former defensive coordinator proved his program was no fluke in 2013, guiding the Colts to an AFC South title and logging an unbelievable playoff victory. He might talk a lot -- OK, he does talk a lot -- but Ryan's tenure has carried much substance, as well. Ryan led New York to two straight AFC Championship Game appearances in his first two years at the helm, but quarterback woes have left Gang Green hovering in mediocrity over the past three seasons. Jets GM John Idzik has exhibited confidence in Ryan, providing him an opportunity to ride it out with either the young Geno Smith or veteran Michael Vick under center. That said, this could be a do-or-die season for the coach. You're staring at the longest-tenured head coach in the NFL not named Bill Belichick. It's a bit surprising, given the Bengals' lack of postseason success and Lewis' so-so popularity, both in town and in league circles. None of this is to say he hasn't done a nice job, considering this team was nothing short of awful from 1991 to 2002. Lewis took charge in 2003, taking Cincy to the playoffs in '05, '09, '11, '12 and '13. Still, no postseason wins to date. After a year out of the game, Smith looks to push Tampa Bay back into the NFC South fight. The Bucs have not been a true threat in the division since they took it in 2007, when Jon Gruden was still roaming sidelines (... as opposed to taking 20-year-old quarterbacks to the dry-erase board). Smith's résumé includes a Super Bowl appearance and an NFC Championship Game berth in 2010. His nine-year tenure in Chicago didn't seem to be appreciated until he was dismissed following the 2012 season -- during which he won 10 games. I'd like to see one more full year at the helm from Arians before placing him any higher on this pecking order. Arians was named 2012 AP Coach of the Year for his work as the interim head man in Chuck Pagano's stead, which led to his prompt hiring in Arizona last offseason. He continued his brief -- but impressive -- head-coaching run by pushing the Cardinals to 10 wins, including a victory over the soon-to-be-world-champion Seattle Seahawks -- in Seattle. Fisher is difficult to assess. This season will mark his 20th year as an NFL head coach, tying him with Belichick for the most among active participants. It's been a long while since a Fisher-led football team has made the playoffs -- you have to go all the way back to the 2008 Titans. Still, Fisher has the respect of nearly everyone in the business, and did lead Tennessee to the Super Bowl in 1999. Smith certainly had a rough go of it in 2013, but his prior track record can't be forgotten. The Falcons posted winning seasons in each of his first five years at the helm, which is notable, considering the franchise had never posted consecutive winning seasons prior to his arrival. Smith also led Atlanta to only its third NFC Championship Game appearance in 2012. Reid certainly proved his coaching chops last year, taking over a 2-14 club and flipping it in historic fashion. Few teams have enjoyed the kind of turnaround the Chiefs did in 2013, improving their win total by nine games. Reid hung his reputation on Alex Smith ... and was rewarded handsomely for the "gamble." Oh, and those five NFC Championship Game appearances in Philly look pretty nice on the résumé, too. Tomlin took the proverbial baton in Pittsburgh from Bill Cowher, who got it from the late, legendary Chuck Noll. Although not necessarily regarded as a "premier" head coach, Tomlin has enjoyed great success since he was hired in 2007. Interestingly enough, some league observers feel he deserves more respect, while others have him on the hot seat in Pittsburgh. What you can't take away from him is the Super Bowl ring he won in the 2008 season, as well as another appearance on the big stage two years later. Not a bad seven-year run. Fox's career arc definitely has experienced twists and turns. ... He took over a 1-15 Panthers outfit and nearly guided it to a Super Bowl title in just his second year on the post. Fox took Carolina to the playoffs two more times, but his days were numbered after a horrific 2010 campaign. Fox then took on a new challenge in Denver, inheriting the Tim Tebow situation. He got that team to the postseason, too. And over the past two years, Fox and Peyton Manning have teamed up to make the Broncos an elite threat in the AFC. Yes, Seahawks fans, we realize Carroll won it all. So has every coach remaining -- save for Jim Harbaugh. So why is Carroll ranked beneath his rival? Because Seattle went 7-9 in each of Carroll's first two seasons with Seattle. He also trails Harbaugh in the head-to-head series, four games to three. However, if Carroll gets his club back to at least the NFC Championship Game, he might fly past Harbaugh and vie for the spot just below Belichick. Another top-notch head coach who has his club in the playoffs every year. Yes, McCarthy's group has been one-and-done in two of the past three postseasons, but the fact is, this team has made it every season since 2009 -- and the Pack won it all in 2010. In addition to being a fine overall head man, McCarthy is a masterful play-caller. Of all the organizational frontmen on this list, Coughlin is the hardest guy to rank. He is one of just two active head coaches with multiple Super Bowl wins, and he also took the expansion Jacksonville Jaguars to two AFC Championship Games. His is an interesting Hall of Fame case. The only downside for Coughlin is the fact the Giants missed the playoffs in 2009, '10, '12 and '13. Tough ranking John below his younger brother, especially considering the elder Harbaugh's team won in the head-to-head matchup for all the marbles. The only knock here is that Baltimore missed the postseason altogether last year in a somewhat-weak AFC playoff field. Harbaugh has gone 62-34 in the regular season. Say what you will about Jim Harbaugh's temperament, but no head coach in the history of the NFL can mess with his first three years -- three straight NFC Championship Game appearances. Harbaugh's club narrowly lost to the Giants in the 2011 NFC title game and the Seahawks in last season's installment. In 2012, the Niners advanced to the Super Bowl and almost pulled off a thrilling comeback victory. San Francisco has won 36 regular-season games in Harbaugh's first three years; the franchise won a mere 21 in the three seasons prior. So, let's see ... in 2011, the Saints go 13-3 with Payton. Then the coach gets suspended for the 2012 campaign, and New Orleans drops to 7-9. Payton returns last year and leads the Saints to an 11-5 mark. Notice a pattern? Payton is indispensable to this franchise. He's taken the Saints to the playoffs five times, making the NFC Championship Game twice and winning the organization's only Lombardi Trophy in 2009. Still an easy choice as the top head coach in the NFL. Belichick had his Patriots in the playoffs last season for the 11th time in his 14 years on the job, with New England advancing all the way to the AFC Championship Game for the eighth time in that span. Belichick also has led New England to five Super Bowls, winning three. And let's not forget he earned two more rings as Bill Parcells' defensive coordinator in New York.